Does your industrial plant or factory require engineering supplies? Then get in contact with A.L. Industrial Products Ltd. today. Welcome to A.L. Industrial Products Ltd.
A.L. Industrial Products Ltd. supplies industrial plants and factories nationwide with quality engineering equipment. From our base in county Kildare, we’ve been supplying the Irish commercial market with the very best in engineering supplies for 3 decades. In that time, we’ve developed a sterling reputation within the manufacturing community for the reliability, speed and ease of our service. We offer all our customers an unparalleled level of personal service. Our ties to the business manufacturing community run deep and we supply our quality products to some of the biggest and most well-known manufacturing companies in Ireland. Does your industrial plant or factory require quality engineering supplies? Gaskets are generally used to seal the space between two mating services. Gaskets prevent leakages from joined objects while said objects are under pressure. A.L. 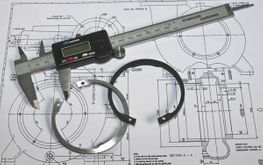 Industrial Products Ltd. supplies a full range of gaskets suited to industrial plants and factories. Glass webbing, glass rope and glass ladder tape offer properties fantastic thermal insulation. We supply coils of various lengths and all our glass webbing is suitable for temperatures of up to 550c. A.L. 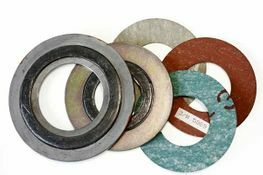 Industrial Products Ltd. provides industrial customers with a full range of sheet gaskets. Our sheet gasket options include Silicone rubber sheeting, paper jointing, and sponge sheeting with a scrim adhesive. Sponge Rubber Strips/Coils is a versatile piece of kit used for a variety of applications. Our strips and coils range in width and can be used for a number of common applications. Our O-rings are available in silicone, Nitrile, Kalrez, Viton and PTFE. Our range of cords are available in sponge, rubber, Nitrile and silicone. We provide a range of essential raw materials for boiler maintenance including packing sleeves and cones, sight gauge glass tubing and Boiler Door Gaskets. These seals provide the maximum economy when sealing caustic media like pH 0-14 and acid. Most of the gasket material is used as a filler gasket. We provide customers with a range of packing materials including packing Graphite, PTFE packing and Packing Extractors. These gaskets are made from a combination of metallic and filler material. These gaskets are normally made of metal that is wound outwards in a circular spiral. A.L. Industrial Products Ltd. provides a full range of other products that are designed for use in industrial plants, warehouses and factories. For more information on our full product line. Get in contact with A.L. Industrial Products Ltd.
About A.L. Industrial Products Ltd.
A.L. Industrial Products Ltd. has been providing industrial clients with the very best engineering supplies for the past 30 years. We’re a completely Irish owned and family run company. With an ethos that prioritises the needs of the customer and delivering unrivalled customer service, A.L. Industrial Products Ltd. have developed a reputation for our professionalism, reliability and the quality of our service and products. For more information on A.L. Industrial Products Ltd. get in contact with us today.